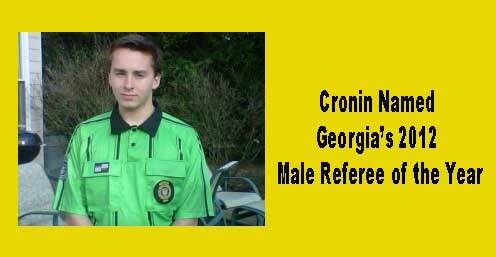 Cronin name 2012 Georgia Male Referee of the Year! United FA's Daniel Cronin was announced as Male Referee of the Year at the GA Soccer Awards Banquet Friday (1/27/2012). Daniel will be joining the Marines in the Fall. Congratulations - we are proud of you! UFA's own Anthony Remensnyder wins RIII and is in line for National Youth Referee of the Year in February. Anthony Remensnyder balances a busy high school academic and athletic career with referee development. His dedication has paid off, as he was the only youth male referee selected out of the 12 from Georgia to participate in the US Youth Soccer Region III Championships in 2011. A Grade 8 referee, Remensnyder also mentors other youth referees. Additionally, Remensnyder is a part of Georgia’s Advanced Referee Development Program.